The Advance Reader Copies of Hearts of Shadow arrived! To celebrate (and celebrate Sunday’s Seahawks win over the other Washington), I’m giving away 5 copies on Goodreads. 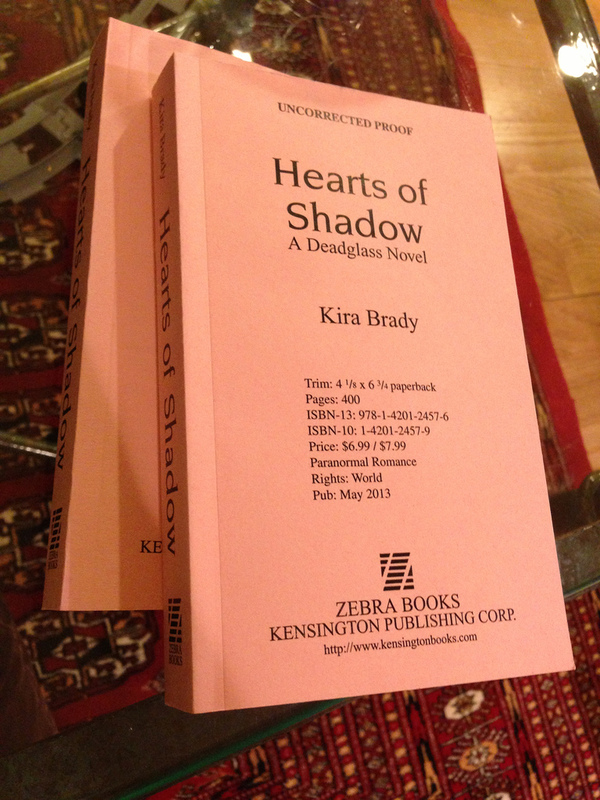 Hearts of Shadow will be available in all its hot pink glory at a book store near you on May 7, 2013. It’s the second book in the Deadglass Trilogy and the novella, HEARTS OF FIRE, Deadglass 0.5, is printed in the back. Grace Mercer’s unmatched wraith-killing ability made her the unofficial defender of a city shattered by supernatural catastrophe. So there’s no way she’ll allow the new regent of Seattle’s most powerful dragon shifter clan to “protect” her from a vicious evil stalking the ruined streets–and keep her from the freedom she’s risked everything to earn. Leif’s science-honed instincts tell him Grace is the key to keeping shifters and humans safe. But helping this wary fighter channel her untapped power is burning away the dragon’s sensual self-control and putting a crucial alliance at risk. Soon the only chance Leif and Grace will have to save their world will be a dangerously fragile link that could forever unite their souls…or consume all in a storm of destruction. Giveaway ends January 21, 2013. Need more? There is now an excerpt from Chapter 2 up on the HEARTS OF SHADOW page. He could do this for her. He could make her forget. He could run her ragged until she didn’t remember her own name, squeeze every last drop of passion and pain from her body, leave her languid as sea kelp washed upon shore. He wanted to be the white knight that swept her off her capable feet, the man she turned to when the storm thundered. She ground herself against him. Her hands tangled in his hair. Her teeth clamped down on his lip hard enough to draw blood. It would heal her, and she took it as her right. The darkness raged up inside him, all semblance of control thrown over for a moment as his primitive self demanded he take what was offered and drive himself into her sweet bliss. She sucked his tongue into her mouth. He saw stars. But his civilized part heard the sorrow behind her moans. And his civilized part felt the shaking of her limbs and tasted the desperation in her kiss. No man was a saint, him least of all, but civilization depended on man controlling his instincts. Without that fierce self-restraint he was no better than Kingu. Leif waited a beat for his blood to heal her wounds, and then he softly disengaged. He pressed his forehead to hers. Her heavy breathing bordered on sobs. His forearms supported her weight, while his fingers swept small, soothing circles across her back. “It will be okay,” he whispered. The tension slid out of her like a body giving up the ghost. She slipped her legs from around his hips to touch the ground. She fell into his embrace, and he rested his cheek on the top of her head. He held her as she cried. This entry was posted on Tuesday, January 8th, 2013 at 11:45 am in Contests, Hearts of Shadow, The Deadglass Trilogy. Tagged: ARC giveaway, book contest, Deadglass, dragons, goodreads, Hearts of Shadow, Kensington Books, Kira Brady, paranormal romance, post apocalyptic, Seattle fiction, shape shifter, zombies. You can feed this entry. Both comments and pings are currently closed. Very cool giveaway! Thanks for doing this :).